Healthy foods for your child’s healthy weight gain! “Why is your baby so thin?”, “Doesn’t your child eat?” – If you have encountered these questions from well-meaning relatives or even from complete strangers, you are not alone! If your baby is active, alert and reaching developmental milestones in time, you have nothing to worry about. Having said that, it is important to include healthy calories and good fats in the diet that help with brain development, facilitate heart health, and give the energy to enjoy an active day! As a happy side-effect, they also contribute to a healthy weight gain in kids. 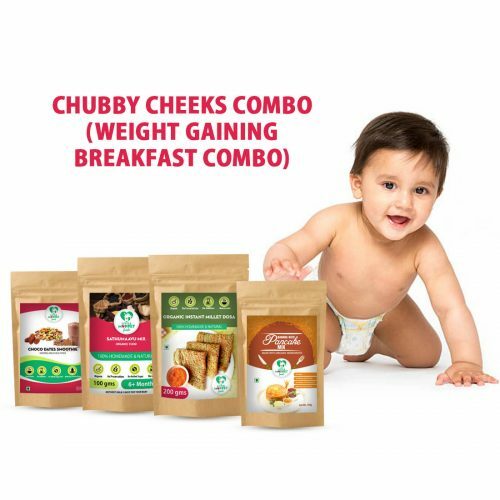 We have handpicked 4 packs for you so your child can get the healthy calories that their developing bodies need. Little Moppet Foods’ Banana Oats Pancake Mix - Our Banana Oats Pancake mix is brimming with dietary fiber, good fats, protein, potassium and lots of energy for a growing child! 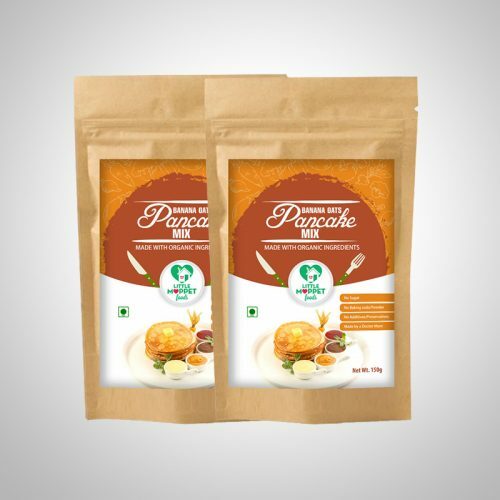 Little Moppet Foods’ Multi-millet Dosa Mix – A miracle mix, our multi-millet dosa combines the best of nutrition that can be made in the least amount of time. Little Moppet Foods’ Sathu Maavu Mix – When millets, pulses, rice, wheat and dry fruits come together in a bowl, it’s nothing short of a nutritional powerhouse for your little one! 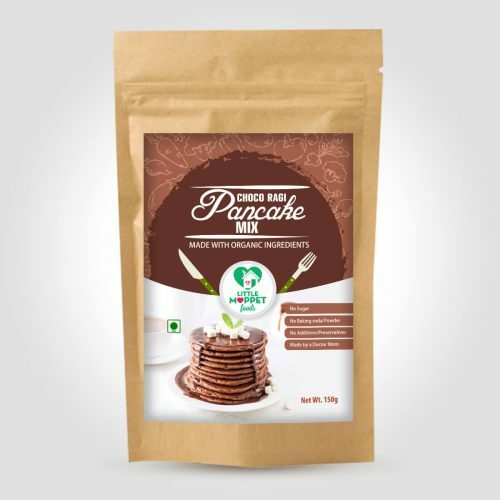 Little Moppet Foods’ Choco Dates Smoothie – This yummylicious chocolatey drink is packed with iron, potassium, copper, calcium, fiber and a tonne of other nutrients minus any added sugar or preservatives. 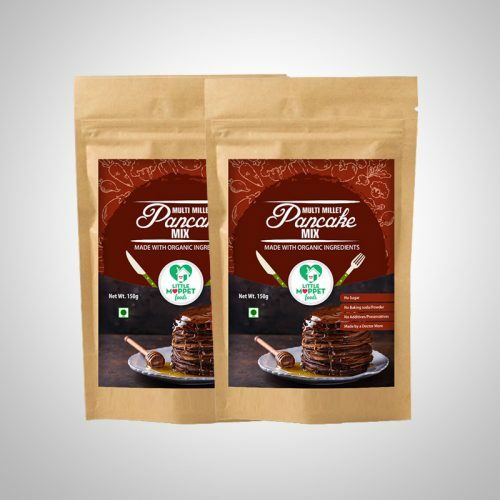 Our Chubby Cheeks Combo comes with 75 gms of the Banana Oats Pancake Mix, 100 gms of Multi-millet Dosa Mix, 100 gms of Sathu Maavu Mix and 50 gms of Choco Dates Smoothie. Order this combo today and save Rs 66 ! Here’s something your kids will love – chocolate for breakfast! 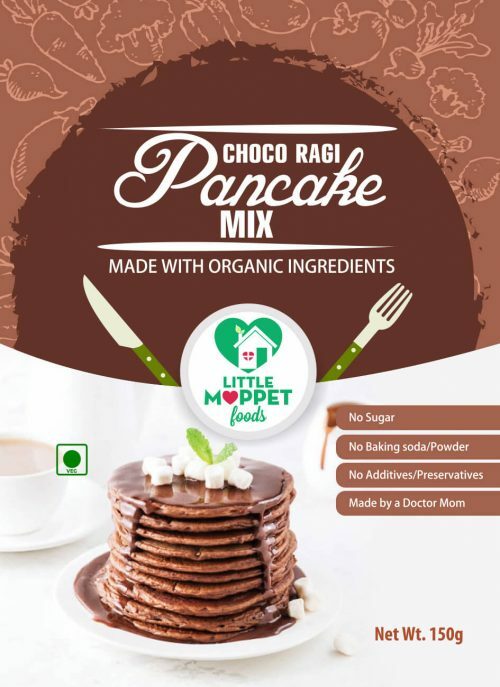 You wouldn’t normally consider chocolate or cake as ideal breakfast foods, but we’ve turned this idea on its head with Little Moppet Foods’ Choco Ragi Pancake Mix! Yes, now the fussiest kids will eagerly gobble up their breakfast! That brown color isn’t just because of yummy chocolate – it’s also thanks to a super nutritious ingredient – finger millet! Ragi is one of the best things you can feed your child, since it contains loads of protein and calcium that those growing bones need. And since this mix is all whole grain, you can be sure that it keeps those little tummies full till lunch! In case you’re wondering about the ‘choco’ part – don’t! 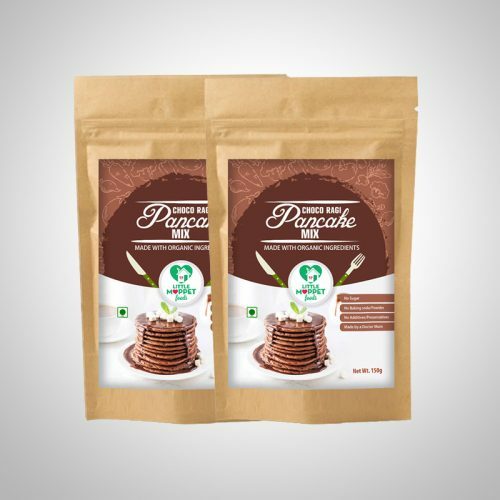 Little Moppet Foods’ Choco Ragi Pancake Mix contains only 100% pure and natural cocoa powder, free from sugar or any kind of added flavors. So now your kids can enjoy the best of both worlds in this convenient dish! Make your family’s morning meal a multi-nutritional one! It’s no secret that breakfast is the most important meal of the day – it’s something that we’ve heard a million times! However, many people think that to give this meal due importance, it is necessary to slave all day in the kitchen. 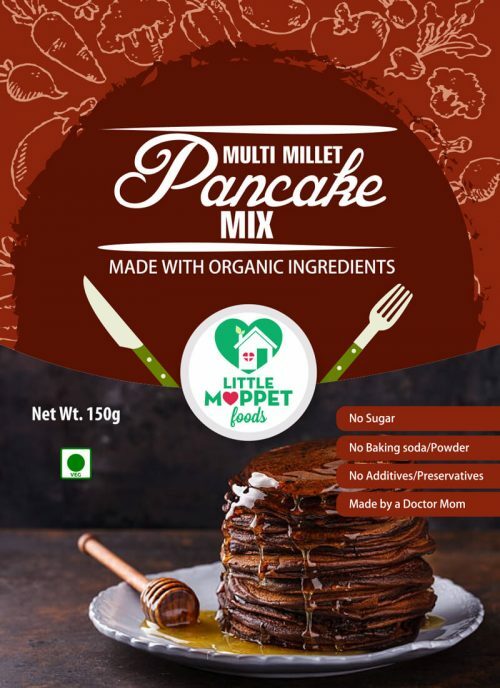 Not anymore, when you can have the benefits of multiple grains and millet with Little Moppet Foods’ Multi Millet Pancake Mix! Nutritional experts recommend a breakfast that is rich in protein and carbohydrate, along with a serving of fruits or vegetables. With multiple healthy ingredients, all you need to do is add some fresh fruit to your plate! Finger millet provides loads of calcium and protein, along with sorghum which gives the added benefits of iron, fiber and antioxidants. 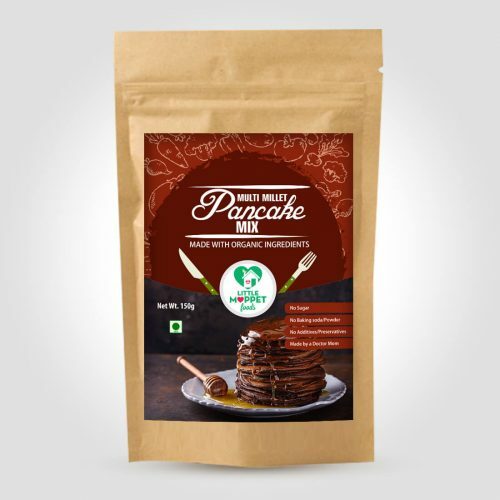 And considering the fact that you can get all this in a mix that can be cooked in a matter of minutes, Little Moppet Foods’ Multi Millet Pancake Mix is a miracle in itself! With such a filling and nutritious breakfast, you can ensure that the family stays full till lunch, and there’s no overeating even after that! Here’s the perfect solution for your fussy eater’s morning tantrums! Got a fussy eater at home? You’re not alone! 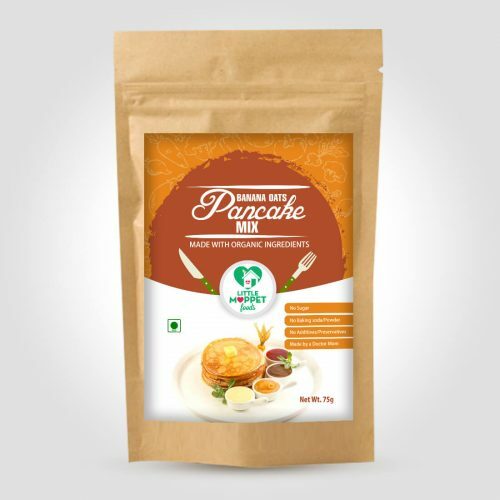 However, with Little Moppet Foods’ Banana Oat Pancake Mix, you can be sure that at least breakfast goes smoothly with your little one! Compromising on the morning meal is worse than picky eating at other times, since your child hasn’t eaten anything for several hours at a stretch. That’s why our Banana Oats Pancake mix is packed with dietary fiber, protein, Vitamin C, potassium and lots of energy for a busy day ahead! 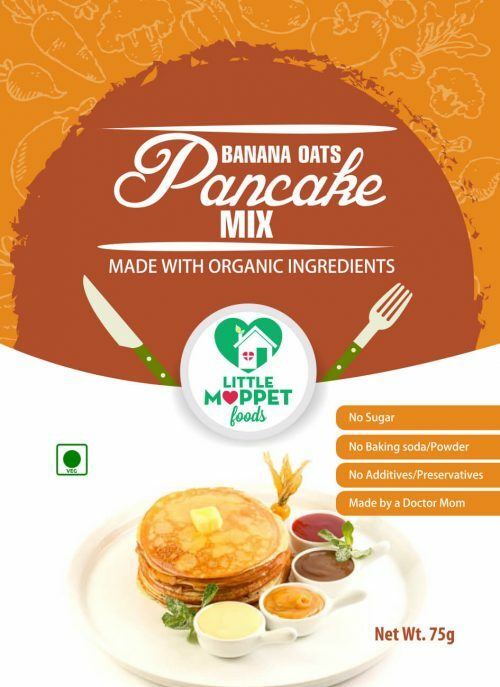 Little Moppet Foods’ Banana Oats Pancake Mix has only the good stuff – no added flavors, preservatives or chemicals of any sort. And if you’re wondering how it’s going to taste, don’t worry – the raw Kerala Banana powder adds loads of sweetness and flavor!